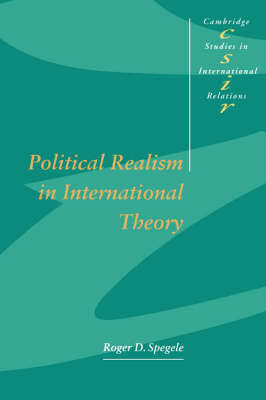 In this 1996 book Roger Spegele argues that in the past international theorists have failed to recognise that there is not one conception of international relations, subdivided into different theories and approaches, but at least three wholly different conceptions of the subject. Though scholars are increasingly prepared to accept this, there is still no consensus about what to call these conceptions, how to describe them, and why they should be studied. This book attempts to fill this gap. The author first examines two conceptions of IR - positivism-empiricism and emancipatory international relations - which challenge political realism. He then defends a revised version of realism, called 'evaluative political realism', from challenges arising from its rivals, with the aim of defining a conception of political realism which is coherent, viable, and attractive.